Emma was a wonderful book to read. This was a book that I had to read for class and I am so glad that I did. Emma Woodhouse is the beautiful, talented, well-thought-of, well-off daughter of the reclusive Mr. Woodhouse. She has a love of matchmaking and her previous successes mean that she has excellent confidence of her taste and choices. Perhaps a little too much confidence. She becomes acquainted with Harriet Smith, a local orphan, who admires her and follows her guidance almost without question. Emma befriends Harriet also turning her into a kind of side project to teach her and guide her to better herself. Harriet takes Emma's word as gospel and follows her advice to the letter regardless of Emma's recent string of bad advice. 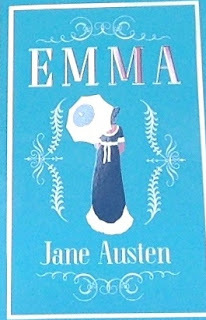 Things become interesting as Emma attempts to find a love for Harriet when Emma's matchmaking becomes infinitely more complicated. I loved to watch how Emma worked. She has such confidence in herself and in her choices that it is annoying but also highly entertaining. Harriet is the opposite. She is so easily swayed out of her choices and so easily guided you almost wonder if she has a personality at all. The situations that Emma finds herself in is amusing and entertaining. I loved how things worked out and how the novel concluded both plot-wise and in character development. I thoroughly enjoyed this book and I am excited to read more of Jane Austen's work for class.